Plus…get my free Red-Hot Checklist to get and keep you on the right path. Is your brand holding you back from making more money? Take the Brand Sizzle quiz and find out now! How to brand out, stand out and cash in! COACHING: How to brand out, stand out and cash in on your expertise! We live in a loud and media-centric world; you must make enough noise to boost your visibility and profitability. Liz works with you to establish your brand DNA, determine your key point of difference, create compelling marketing messages, and determine how to sell the brand called YOU! SPEAKING: Fiery speaker who gets audiences learning and laughing. BRAND NAMING & CONSULTING: The expert who thinks like your customers. SPEECH COACHING: Give a killer-good talk or become a professional speaker. Thanks to technology, we speak less, but it counts more. Every time you open your mouth is an opportunity to earn respect, credibility, and even the business. BUT, if you, like thousands of others, fear giving a presentation or are worried that you won’t knock it outta the park, then you need to Speak to Liz. 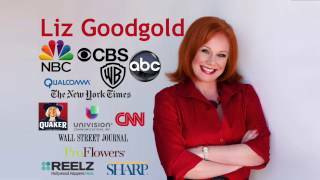 Hi, I’m Liz Goodgold, and I’m officially a brand builder, “motivational speecher” and trainer, word girl and business coach who typically gets my clients to boost their income by a whopping 40%! Using my blue-chip background at Quaker Oats, Times Mirror, Arco Oil, and Macmillan Publishing, I create compelling strategies, repositioning ideas, and new product launches to make money faster.